Tradition meets the exotic: Sweet banana and sour physalis in an organic country mix. This combination stimulates your taste buds and boosts your energy. Perfect for everyone who likes a more intense flavour. Runners absolutely love bananas. What’s good for endurance athletes is good for us all: Quick carbohydrates support performance whenever you need a boost. Physalis is one of the most protein-rich fruits in the world. Both combine valuable vitamins. This all-round booster will make you fit. No matter where or when. Bananas are naturally sweet. Physalis are naturally sour. We have combined both flavours. That’s it. No sugar, no fat. No frills. 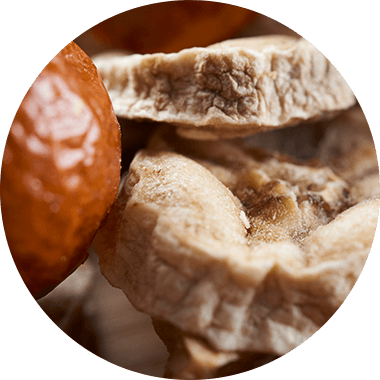 Our patented drying process maintains the natural flavour and 80% of the vitamin content. This not only makes Crunchy Fruits incredibly delicious, but also healthy. We use only the very best organic sources. Because nature is perfect in its purest form. Our organic bananas from Ecuador are harvested young and are then processed when they have reached their peak maturity. We use all of the organic physalis for our Crunchy Mix. Every fruit is strictly tested for quality. Temperatures are constantly kept at under 70°C during the drying process. This lets them keep 80% of their vitamins. Sweet & sour. Energy & enjoyment. 100% organic. Dried bananas and physalis. 280 g of fresh physalis and 190 g of fresh bananas are used for the production of 100 g product. Crunchy Fruits are a deliciously crunchy snack between meals. 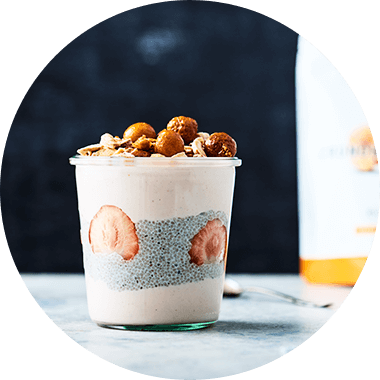 In muesli, as a snack between meals, for a sweet dessert, as an energy booster in the afternoon or as an evening snack on the couch. The low calorie content and fresh, natural taste makes our Crunchy Fruits an excellent choice for a small energy boost while travelling, for outdoor activities or as an alternative to sweets as part of a healthy weight-loss diet. Snacking without regret. Out and about, at the office, on the way to the gym or at the cinema. Our dried banana/physalis are the perfect choice when you get peckish between meals. Banana and physalis – the combination where sweet meets slightly sour. 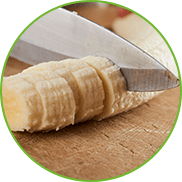 The bananas add a large amount of potassium and magnesium which hugely benefit athletes. Physalis contains plenty of Vitamin A, C and E. That makes them the perfect companion for an active and healthy lifestyle. Bananas also contain filling fibres and important B vitamins. Physalis furthermore contains iron and keratin which is good for your eyesight. Both fruits are great for a healthy lifestyle and are an important part of a balanced diet. If you do start getting any cravings, dried bananas and physalis are just what you need. They have less calories than sweet snacks, but curb your appetite while offering plenty of valuable vitamins and minerals. Fruity and crunchy at the same time, these snacks are rich in nutrients, taste great and make a brilliant addition for your favourite dishes. 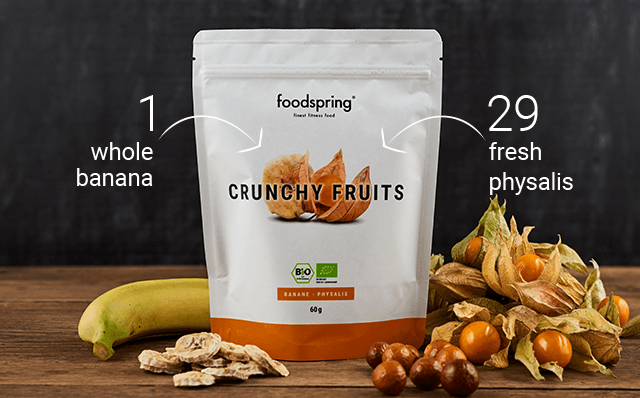 Our banana/physalis Crunchy Fruits are made without any additives. All you get is natural fruits of the highest organic quality. The gentle processing and vacuum drying of these fresh fruits maintains 80% of their vitamins. A deciding factor of gently dried fruits is their high nutrient content. While bananas and physalis will lose some of their volume during the drying process, they loose hardly any of their vital nutrients. 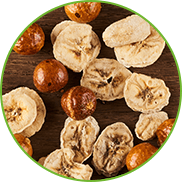 The patented Päx drying process also means a longer shelf life for our banana/physalis Crunchy Fruits – and they won’t get soft or sticky. 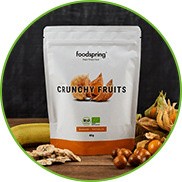 Dried fruit – as opposed to fresh fruit – should not become soft and mushy and the resealable packaging keeps them fresh and ready whenever you are. Sweet banana meets sour physalis. Our banana/physalis Crunchy Fruits have wonderfully harmonised flavours. A brand new taste sensation. Our dried fruits are not just fruity, sweet and sour, but also uniquely crunchy. Our bananas are, as opposed to traditional dried bananas, not deep-fried – which means they won’t end up being rock hard, like many other products. What’s more, they contain no added sugar, honey or other sweeteners. We insist on purely organic quality, which is why we don’t treat our dried fruit with sulphur or any other chemicals. Dried bananas contain magnesium and potassium, which makes them a great source of energy and helps to maintain or replenish your electrolyte levels. Dried banana and physalis will also keep you fit during longer workouts. Dried physalis is a great snack choice when body sculpting, as it contains hardly any sugar and fewer calories. Physalis contains essential nutrients, vitamins and high-quality fatty acids. That is how they help with a healthy lifestyle. Once our fruits are washed, cut and pre-dried, they are put through the final drying process. The fruit is vacuum-dried with heat and then gently dried to finish off. The advantage of this method is the combination of applying a vacuum, temperatures below 70 degrees and meticulous preparation. This method ensures that the natural flavours and 80% of the original vitamin content are retained. Our dried fruits are free from any additives and are 100% natural organic quality. 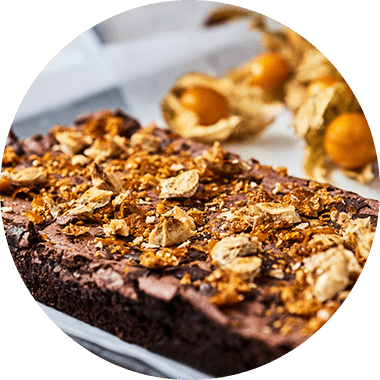 A perfect snack for before or after training or between meals, when you are feeling peckish. The carbohydrates in the banana/physalis Crunchy Fruits bring your body back in action and give you an energy boost. They refill the glycogen stores in your muscles after a workout, so that you can get right back to it in no time. When we are stressed, we tend to go for chocolate and other sweet treats. 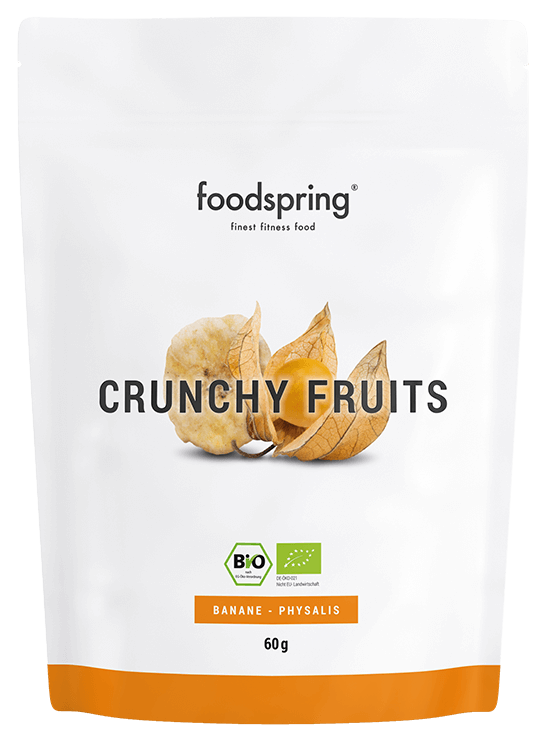 Our banana/physalis Crunchy Fruits are the perfect alternative! They contain valuable vitamins and minerals that keep you fit. Instead of going for popcorn or nachos at the cinema, why not reach for these delicious dried fruits instead? Our dried bananas/physalis are highly versatile. They add a fresh and delicious taste to your morning muesli. They transform any boring yoghurt into a dessert highlight. Add a brand new flavour to your favourite salads. 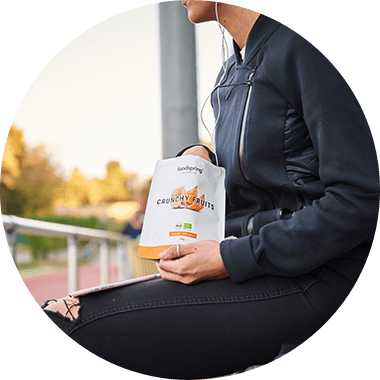 Eating healthy works wherever you go with dried bananas/physalis. They are super practical to take with you. At the office, doing sports, on trips or wherever else you find yourself feeling a little peckish. 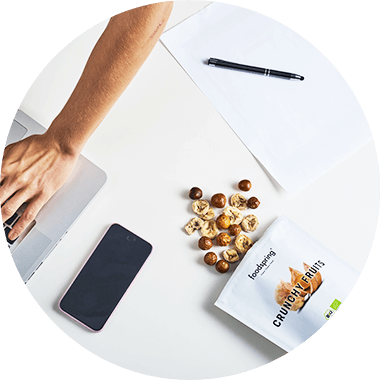 Our Crunchy Fruits are the best healthy alternative. The natural flavours of those two fruits taste amazing in our Crunchy Fruits. The contrast of sweet and sour is therefore particularly intense. But don’t worry: It isn’t super sour. Both fruits perfectly compliment each other and your taste buds will be singing! What is good about the combination of banana and physalis? Bananas have a high energy content. That makes them the perfect energy source when you hit a wall doing sports or everyday activities. Physalis contains high quality plant-based proteins and is one of the best sources of pro-vitamin A when it comes to fruit. Are dried bananas not very hard? Many dried banana products are indeed hard enough to chip a tooth. But not our Crunchy Fruits bananas. We add no fat or sugar glaze and only dry the pure fruit – that makes our dried bananas crunchy, but never hard. Try it for yourself. Our special PÄX-drying process helps maintain the natural sweetness of the pineapple and strawberries. The sweet flavour is simply from natural fruit sugar. Vacuum drying is an ultra gentle process that protects nutrients. Unlike traditional drying methods, this process retains up to 80% of the original nutrients contained in the fresh fruit. 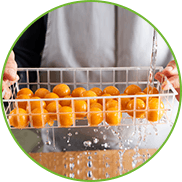 Our bananas and physalis are washed right after harvesting, then sliced by hand, pre-dried and finally vacuum dried with applied heat.